Film adaptations of historical events face several difficulties, including issues of historical accuracy and the audience’s awareness of how it all ends (Titanic). Robert Redford’s latest film Conspirator approaches these pitfalls by producing the tale under The American Film Company, which aims to produce historically accurate films. Further, Conspirator tells the story of Lincoln’s assassination from an angle with which few are familiar. 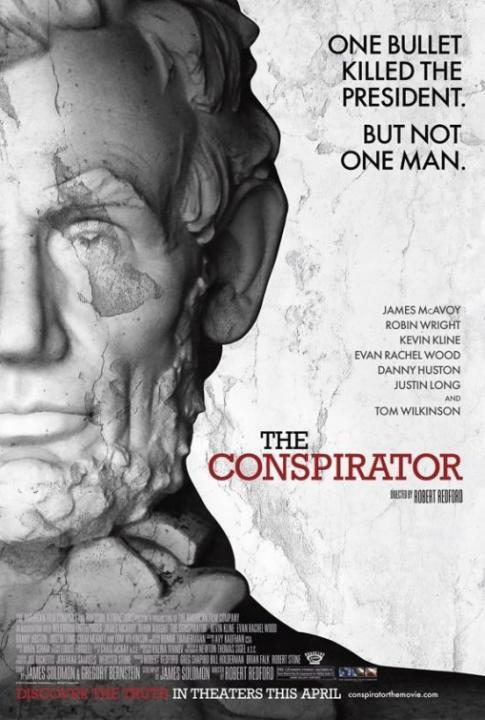 Conspirator revolves around the military tribunal of Mary Surratt (Robin Wright), a woman whose boarders happen to include John Wilkes Booth and her son John Surratt, who is implicated in the conspiracy to assassinate President Lincoln. With the authorities unable to locate John, Mary is put on trial in his place. Frederick Aiken (James McAvoy), a lawyer and former Union Soldier, must defend this Confederate sympathizer in the face of pressure from the Secretary of War to swiftly convict Surratt, whose death sentence is intended to deter any further action from Confederates that might break the post-Civil War peace. This historical trial drama runs on two fuels: a mature, varied cast and a fresh story. James McAvoy as Mrs. Surratt’s attorney achieves a conflicted dignity as a man who respects the law, but endures an internal tug-of-war after his time fighting Confederates as a Union soldier. Surratt herself is in a similarly conflicted position, in which her freedom rests on the conviction of her son. Robin Wright has come a long way from the useless damsel in The Princess Bride, and her adept portrayal of the weight of motherhood is an excellent parallel to Aiken’s mixed allegiances to law and country. And finally, with Surratt’s historical fate unknown to most viewers, Conspirator leaves the crowd anticipating her freedom or destruction with rapt attention. Conspirator does contain allusions to justice in the post-9/11 U.S. landscape, as Mary Surratt finds herself in situations bearing similarities to the present: Gitmo, suspension of habeas corpus, even the evolving trial of alleged 9/11 hijacker Khalid Sheikh Mohammed. As in the film where Mary Surratt is denied a trial of her peers and placed in front of a military tribunal, Khalid will now face a military tribunal in contrast to President Obama’s previous calls for a civilian court proceeding. Fortunately, these elements are not delivered in the overbearing, rub-it-in-your-face style of other films. If Robert Redford and writer James D. Solomon are to be believed, Conspirator has been in the works since the early 90’s, making such allusions more timely than intentional political commentary. Which illustrates the enduring power of yearning for justice. Whether in the present or the past, U.S. citizens have expected their government to conduct itself in the manner outlined in its inception. Deviation from that is enough to agitate anyone. Conspirator demonstrates that having conditional civil rights is like conditional abstinence. Honoring such values only when it’s easy doesn’t honor them at all. A competent historical trial drama, Conspirator should satisfy history nerds and general audiences alike. This entry was posted in Reviews and tagged Conspirator, Historical Drama, James McAvoy, Lincoln Assassination, Robert Redford. Bookmark the permalink.